Update, October 2016: Groups, class discussion, parent access and portfolio are now part of Showbie Pro. Visit our pricing page to see our plans. Whether you’re new to Showbie or a Showbie veteran, it can be tricky to identify the differences between our plans unless you’ve had a chance to try both Showbie Basic and Showbie Pro. 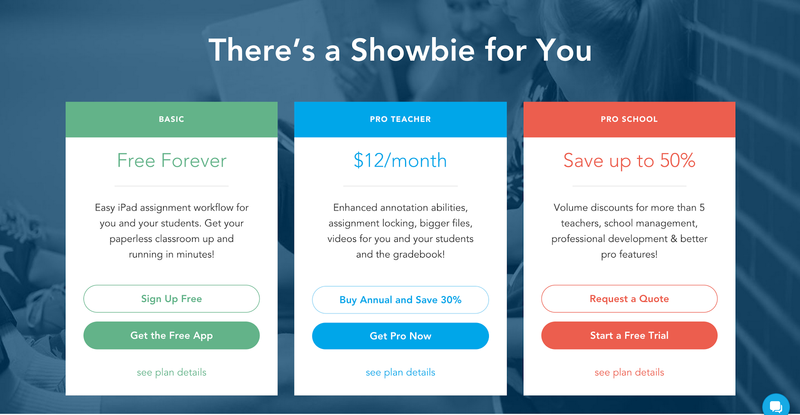 To make it easier for you to see the benefits of each one, here’s a quick overview of Showbie’s two individual teacher plans, and how you can get two free weeks of Showbie Pro to experience the differences firsthand! Showbie Basic is 100% free and the edition many teachers sign up with first. The strengths of this plan are that it takes only minutes to set up, and quickly and easily facilitates paperless workflow in your classroom. It’s an effortless introduction to Showbie, and it allows teachers to set up assignments, exchange classwork with students and annotate their work using the pen tool and pinned text comments. You’re looking for a simple way to enable paperless file sharing between you and your students, including simple and easy-to-use annotation features. If Showbie Basic makes paperless workflow a piece of cake, then Showbie Pro’s rich annotation features put the icing on that cake! 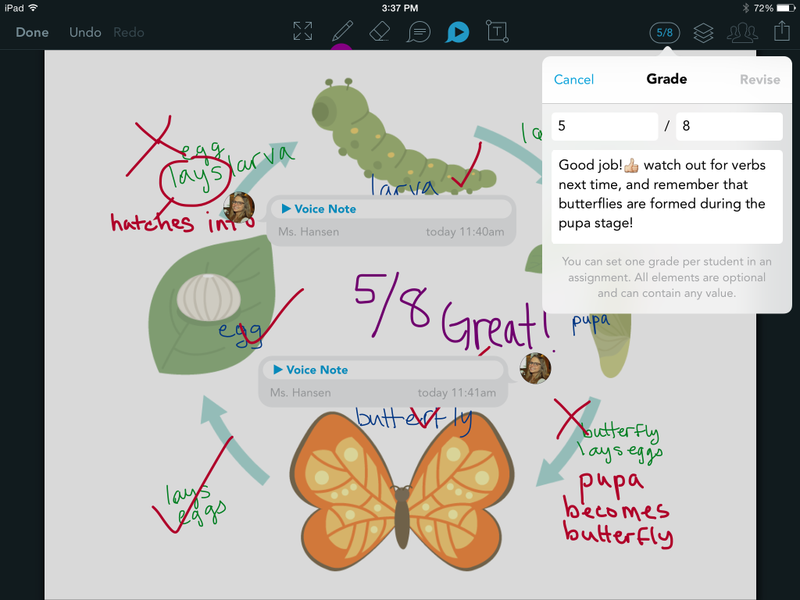 With Showbie Pro, teachers and students have access to a multitude of annotation styles. Different pen widths and colors make it easy to customize answers and distinguish between student work and teacher grading, while pinned voice notes allow students to justify their answers and even provide verbal answers. Teachers also have the ability to pin voice notes to provide customized feedback on specific areas of a student’s work. Showbie Pro’s newest feature, Gradebook, gives teachers the ability to create and add custom grades in numericals, letters or text on individual student assignments. Gradebook not only makes it easy to keep your students’ grades organized electronically, but it comes with a built-in export feature that allows you to transfer grades anywhere you need them. Assignment lock is also exclusive to Showbie Pro. This feature comes in handy when you want to prepare assignments ahead of time or to grade student work in batches and prevent students from going back to view or change their work once you’ve collected it. You want the most comprehensive version of Showbie that allows you to take full advantage of feedback and and annotation features that aren’t available on Showbie Basic, such as the enhanced pen tool, pinned voice notes, assignment lock and gradebook. Try Two Weeks of Showbie Pro – Free! Update, October 2016: Showbie’s share code feature has been discontinued. Visit our pricing page to learn more about upgrading to Showbie Pro. To help you figure out which plan is for you, Showbie has a referral program that allows you and your colleagues to get Showbie Pro free for two weeks. 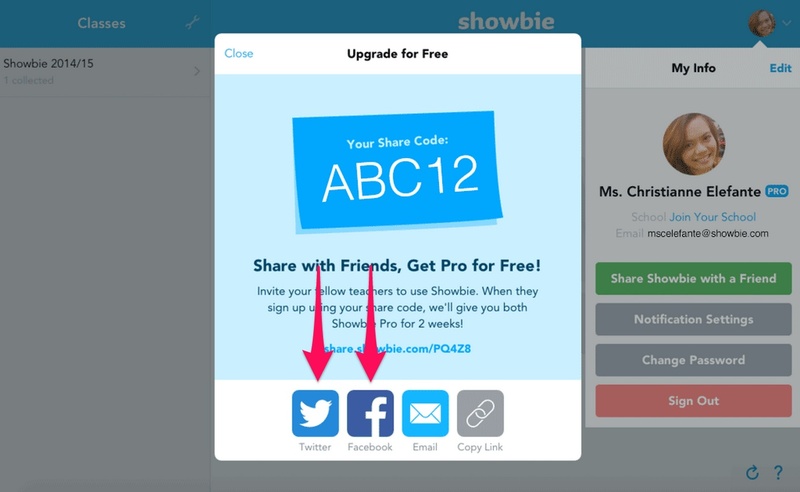 Here’s how it works: when you sign up for Showbie you get a unique share code. Simply share this code with a friend, and when they sign up for Showbie, you will both be upgraded to Pro for two weeks! Read our short tutorial to see how it works. Don’t know any teachers who are interested? You can post your share code on Twitter and Facebook to partner up with teachers in other regions. You’ll be surprised how fast you’ll make friends! As always, if you have any questions about our referral program, you can reach out to our Showbie Support team. Happy sharing!